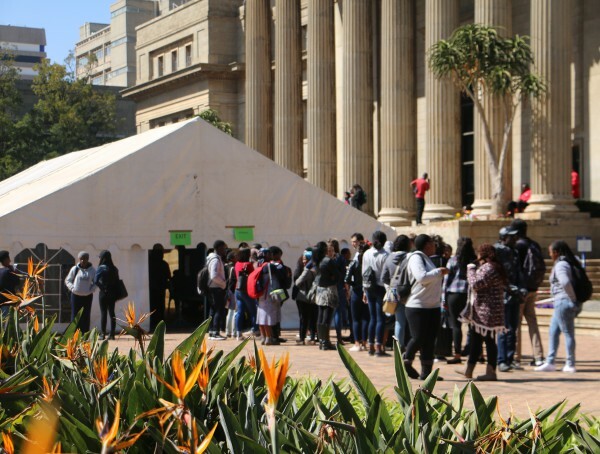 CAMPAIGNING for the highly contested Wits 2016/2017 SRC elections during test week has been a strain for some student political organisations. elections, however, concerns were raised over the university selecting test week to have the elections. “We reject the fact that the university didn’t properly advertise this year’s elections. Which is certainly a direct attempt to undermine the student bodies on campus,” said Hassan. The oﬃcial candidate list for the elections was only released earlier this week and included the Progressive Youth Alliance (PYA), Wits Economic Freedom Fighters (EFF) and Project W. This year the Democratic Alliance Student Organisation (DASO) was not among the candidate list. PYA representative Mpendulo Mfeka, said that students had a democratic right to cast their vote but the short campaign period of just one week had aﬀected voter turnout. Mfeka said his organisation would be releasing an oﬃcial statement that would be handed to the campus electoral commission.Engineering students, Kerone Naidoo and Marguerite Strydom who had not voted for the SRC, expressed their views over this year’s SRC elections. “I feel like the campaigning for this year’s elections was not as loud as last year’s elections,” said Naidoo. Wits Vuvuzela tried to contact the representatives from the Project W and PYA respectively, to get their views about this year’s SRC election, however, no formal comment was given at the time of going to print. Results are expected to be released on Friday, August 26. Please check the Wits Vuvuzela online web page to get the full scope of who will govern in the next Wits Student Representative Council.